LINCOLN, UK, August 7, 2014 (ENS) – Tortoises have learned how to use touchscreens as part of a study which aimed to teach the land-dwelling reptiles navigational techniques. Led by Dr. Anna Wilkinson, from the University of Lincoln School of Life Sciences, the research involved red-footed tortoises, which are native to Central and South America. 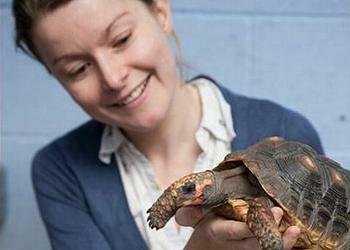 During the research project, four red-footed tortoises were successfully trained to use a touchscreen. Two of the tortoises learned to use the touchscreen to solve a spatial task, and they were able to transfer their knowledge from the touchscreen to a physical arena. The brain structure of reptiles is very different to that of mammals, which use the hippocampus for spatial navigation, Wilkinson explains. Instead, it is thought that the reptilian medial cortex serves that function, yet very little behavioral research has actually examined this. To understand how tortoises learn to navigate around their environment, Wilkinson and her colleagues tested how the reptiles relied on cues to get around. Wilkinson carried out the initial training while at the University of Vienna and worked with her colleagues in the Department of Cognitive Biology there. They gave the four tortoises treats such as strawberries when the reptiles looked at, approached and then pecked blue circles on the screen. Two of the tortoises, Esme and Quinn, went on to apply their knowledge to a real-life situation. The researchers placed Esme and Quinn in an arena with two empty food bowls that looked like the blue circles on the touchscreen. The tortoises went to the bowls on the same side as the circles they were trained to peck on the screen. “This tells us that when navigating in real space they do not rely on simple motor feedback but learn about the position of stimuli within an environment,” she said.